A robotic submarine hunting for the missing Malaysian jet aborted its first mission after only six hours, surfacing with no new clues when it exceeded its maximum depth along the floor of the Indian Ocean, officials says. A robotic submarine hunting for the missing Malaysian jet aborted its first mission after only six hours, surfacing with no new clues when it exceeded its maximum depth along the floor of the Indian Ocean, officials said Tuesday. Search crews sent the U.S. Navy's Bluefin 21 into the depths Monday to begin scouring the seabed for the missing Malaysia Airlines Boeing 777 after failing for six days to detect any new signals believed to be coming from its black boxes. But the 16-hour mission was cut short when the unmanned sub, which is programmed to hover 30 metres above the seabed, entered a patch that was deeper than its maximum depth of 4,500 metres, the search co-ordination centre and the U.S. Navy said. The data collected by the sub was later analyzed and no sign of the missing plane was found, the U.S. Navy said. Crews were shifting the Bluefin's search area away from the deepest water and were hoping to send it back on another mission later Tuesday. Search authorities had known the primary search area for Flight MH370 was near the limit of the Bluefin's dive capabilities. 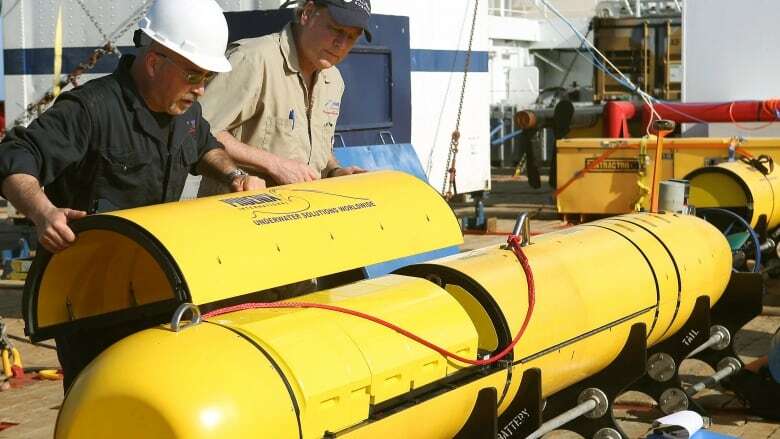 Deeper-diving submersibles have been evaluated, but none is yet available to help. A safety margin would have been included in the Bluefin's program to protect the device from harm if it went a bit deeper than its 4,500-metre limit, said Stefan Williams, a professor of marine robotics at the University of Sydney. "Maybe some areas where they are doing the survey are a little bit deeper than they are expecting," he said. "They may not have very reliable prior data for the area." Meanwhile, officials were investigating an oil slick about 5,500 metres from the area where the last underwater sounds were detected. Crews collected an oil sample and sent it back to Perth in western Australia for analysis, a process that will take several days, said Angus Houston, the head of the joint agency co-ordinating the search off Australia's west coast. The Bluefin can create a three-dimensional sonar map of any debris on the ocean floor. But the search is more challenging in this area because the seabed is covered in silt that could potentially cover part of the plane. "What they're going to have to be looking for is contrast between hard objects, like bits of a fuselage, and that silty bottom," Williams said. "With the types of sonars they are using, if stuff is sitting up on top of the silt, say a wing was there, you could likely see that ... but small items might sink down into the silt and be covered and then it's going to be a lot more challenging." The search moved below the surface after crews picked up a series of underwater sounds over the past two weeks that were consistent with signals from an aircraft's black boxes, which record flight data and cockpit conversations. The devices emit "pings" so they can be more easily found, but their batteries last only about a month and no sounds have been heard for seven days. Australian Prime Minister Tony Abbott raised hopes last week when he said authorities were "very confident" the underwater signals were from the black boxes on Flight MH370, which disappeared March 8 during a flight from Kuala Lumpur, Malaysia, to Beijing with 239 people on board, mostly Chinese. Houston said Monday that the signals were a promising lead, but that finding aircraft wreckage in the remote, deep patch of ocean remains extremely difficult. The black boxes could contain the key to unravelling the mystery of what happened to Flight MH370. Investigators believe the plane went down in the southern Indian Ocean based on a flight path calculated from its contacts with a satellite and an analysis of its speed and fuel capacity. But they still don't know why. 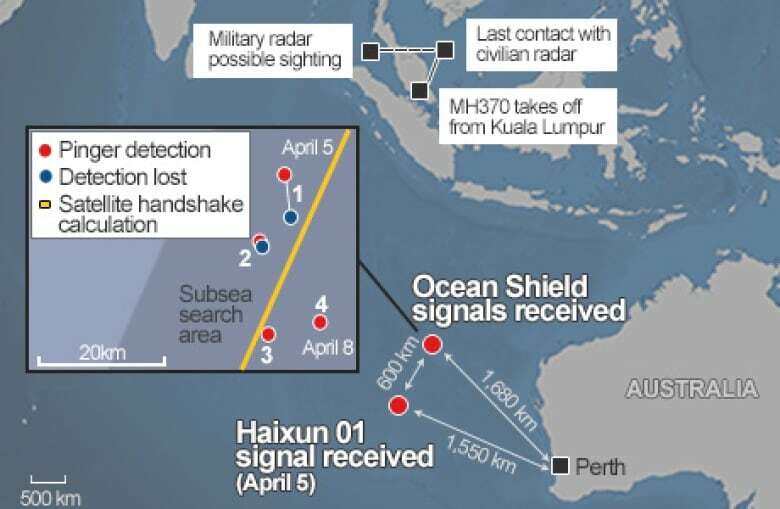 On Tuesday, Malaysia's Defence Minister, Hishamuddin Hussein, pledged to reveal the full contents of the black boxes if they are found. "It's about finding out the truth," he told reporters in Kuala Lumpur. "There is no question of it not being released." Up to 11 planes and as many ships were scouring a 62,000-square kilometre patch of ocean about 2,200 kilometres northwest of Perth on Tuesday, hunting for any floating debris. The weeks-long surface search is expected to end in the next two days. Officials haven't found a single piece of debris confirmed to be from the plane, and Houston said the chances that any would be found have "greatly diminished."